I’m not that much into crime novels myself, but for a long while it has been difficult for anyone interested in literature generally to remain unaware of the name of Stieg Larsson (pictured left), the Swedish author who died a few years ago (in 2004, to be precise) but whose posthumous fictional works have been a tremendous success throughout the world, topping European fiction sales in 2009, for example. Inevitably, a movie based on one book from his so-called Millenium Trilogy will be out in the Spring, The Girl with the Dragon Tattoo (which was actually titled Men Who Hate Women when his works were first published in Swedish back in 2005). Ah – but were they his works? Did he really write them? Doubt about his whole literary output is now cropping up in the Scandinavian press, such as in an article by Uffe Christensen on kpn.dk (“Allegation: Larsson could not write”), the on-line culture pages of Denmark’s Jyllands-Posten newspaper. “Could not write”: Note well that this does not reflect some mere aesthetic judgment (as in “Really, old chap, in the final analysis James Joyce just could not write!”). Rather, these are assertions that Larsson simply did not have the minimal command of the Swedish language to have written “his” fiction himself. The main claim comes from Anders Hellberg, now a journalist at the newspaper Dagens Nyheter, but formerly a close colleague of Larsson’s at the Swedish news agency Tidningarnas Telegrambyrå. (Larsson worked mainly as a graphic designer there, but also was editor – and, supposedly, a writer – for various other science fiction and Trotskyite journals.) 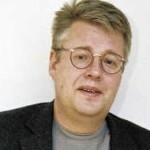 Says Hellberg: “The Millenium-author Stieg Larsson was a master of research, but a poor reporter. One can suspect that his significant-other [DK: samlever] Eva Gabrielsson had an active role in his authorship.” Plus, he had poor handwriting, could not spell, and had a shaky grasp of grammar. Maybe even if it turns out that she did have a rather greater role in helping him write than she is willing to admit, it won’t turn out to be that big a deal. Larsson no longer walks among us, anyway. But if somehow it does, remember: unless you regularly read Danish or Swedish, you probably heard about it here first!